We believe we have sighted a Crowned Slaty Flycatcher in Cerro Azul on Dec 1, 2007 and again in the same place on the 4th. I have attached a photo. The bird matches well the descriptions in the Birds of Colombia and Birds of Ecuador. It matches the photos of the Crowned Slaty Flycatcher we find on the web. We found it on a utility wire adjacent to the Chagres Forest. In size, it is bigger than a Forest Elaenia. It did some flycatching as we watched, returning to its perch after going after a bug. The one thing the photo does not show is that it had a thin yellow line through the crown, which was visible when the wind blew. Also, the base of the lower mandible is lighter than the tip. We were able to observe the bird for more than 30 minutes on each observation. We have more photos - they show pretty much the same as the attached photo; we will submit them when we return home. We have sent the photo to Larry McQueen, who illustrated the new book Birds of Peru. 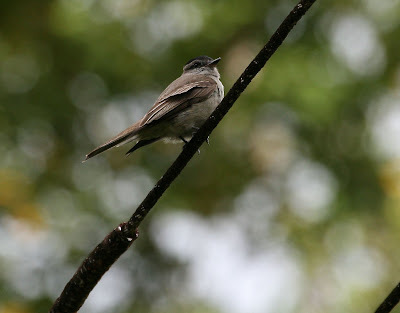 He has independently confirmed that the photo depicts a Crowned Slaty Flycatcher. We found the bird on Calle Principal, just about 100 yards uphill from Calle A near the Hostal Casa de Campo in Cerro Azul, in case others want to look for it. We are four Oregon birders from Eugene finishing up a stay at Canopy Lodge after three days in Cerro Azul. The bird, whose identity has been confirmed by the authorities, was again seen at the same spot by Bill and Claudia Ahrens on December 14.